At another review site I visited recently (and I'll be hanged if I can remember which one), this book was briefly mentioned as one of several retellings of the fairy tale "Beauty and the Beast." I haven't run across another such book as yet, but it would have to be damned good to top this one. This is a lovely reinterpretation of the fairy tale, with an imaginative setting, great characterizations, and lush prose. It's also a sort of alternate-world fantasy, with a pantheon of Greek gods and myths that are one step removed from our own--see this book's retelling of the Pandora tale as an example. But there are layers here, as you discover throughout the book: layers slowly peeled back to show that neither the setting nor the characters are as they seem. It's a wonderful testament to the author's skill and control of her story. The book starts out with a humdinger of an opening: "I was raised to marry a monster." Nyx Triskelion was indeed brought up to do just that, and this marriage is (ostensibly) the only hope of saving her kingdom and her people. This fate, which she has known about since the age of nine, obviously engenders a great deal of resentment, both towards the father who bargained with a demon and consigned one of his twin daughters to marry said demon (with the incongruous name of the Gentle Lord), and towards Nyx's sister Astraia, who will live the normal life Nyx will be denied. This plays into the book's title (Cruel Beauty). Nyx has, as she says, "poison in her heart," and this turns into a major plot point. For a young-adult book, there are some very grown-up themes here. One is realizing there is good and bad in us all, and this doesn't make us monsters; it makes us human. Another is fighting for love and against one's fate. It all adds up to a lovely story, and you should read it. 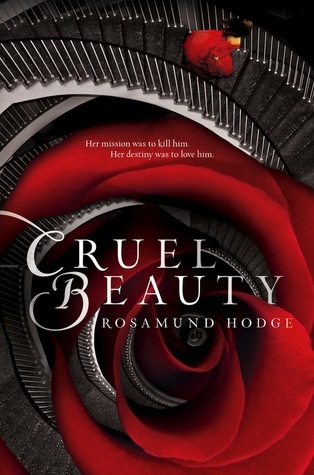 Sign into Goodreads to see if any of your friends have read Cruel Beauty.